Yesterday my 8-year-old son, Felix, sat on my reading glasses and broke them. This was just a few days after my wife suggested I get a new pair as my current set were looking a little tired. So Felix did me a favour. I might have put off getting a new pair for several more weeks or months if he hadn’t accelerated my decision-making process. So I sent an email to the alainexpats yahoo group and asked everyone where I could find the best opticians in town. Within an hour I received an email from Geraldine Kershaw who helps run the Al Ain Choral Society and has lived in Al Ain for many years: she said the place to go was Al Hakeem Optical, opposite the Jashanmal store on Khalifa Street in the centre of Al Ain. An hour later I drove into town, had my eyes tested, and my new specs will be ready within 24 hours! Yippee! There are also branches in the Al Jimi Mall and in the Al Ain Mall too. The price? 100aed for the spectacle frames, reduced from the ticket price of 150aed. Plus 80aed for the lenses with anti-glare and anti-reflection. (I passed on the anti-freeze option: rarely needed in the heat of the desert.) Total: 180aed (£30, US$45). Venus said that, if the workshop didn’t have my lenses in stock, my spectacles would take another day: a total of 48 hours. That’s service. 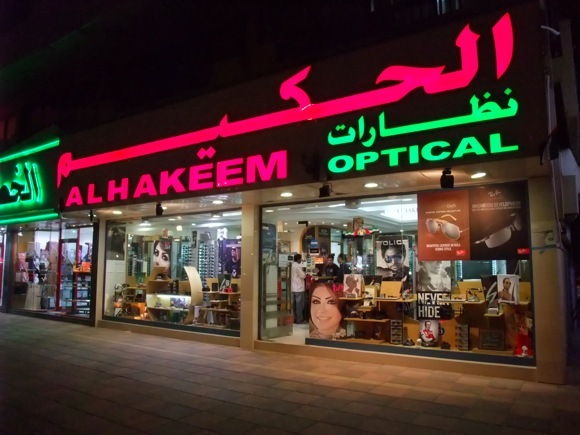 Telephone this branch of Al Hakeem Optical on 03 766 2051. If you pop in, do tell them you found out about them on this site. Thanks!